This World War II-era war ration book belonged to Prince Butler Boston, a prominent African American leader in Oviedo, Florida, who was integral to creating a vibrant black community in Seminole County through industry and his patronage. Boston was the son of a Georgia slave owner, Dr. Alexander Atkinson, who moved to Central Florida in 1885, when Boston was 14 years old. After the citrus freeze during the 1890s, Atkinson abandoned citrus growing and moved to Miami, leaving most his land to Boston. Boston was a member of Antioch Missionary Baptist Church for nearly 61 years, beginning in 1886 until his death in 1947. He was ordained as a deacon in the church and also became the superintendent of the Sunday school, as well. Once membership in the church began to grow, he designed a second choir stand and two additional classrooms. Boston also gave five acres of land to the church to build a cemetery, which is now known as the Boston Hill Cemetery. In May 1942, the U.S. Office of Price Administration froze prices on everyday goods, such as coffee, sugar, and gasoline. Families were issued war ration books and tokens, which dictated how many and how much goods could be purchased by any one family. Various types of rationing included certificate rationing, differential coupon rationing, point rationing, and uniform coupon rationing. Sugar is an example of uniform coupon rationing which provided equal shares of a single product to every American; point rationing issued coupons for points. Theses points could be used for any combination of items in processed foods and meats. Differential coupon rationing provided products based on varying needs. These products included gasoline and fuel oil. In the case of certificate rationing, individuals had to demonstrate need for the products, such as tires, cars, and stoves. 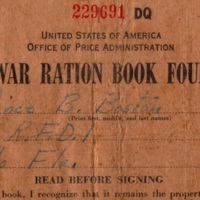 Original war ration book: U.S. Office of Price Administration: Private Collection of Ida Boston. Digital reproduction of original war ration book: U.S. Office of Price Administration. Originally published by the U.S. Office of Price Administration. Copyright to this resource is held by Ida Boston and is provided here by RICHES of Central Florida for educational purposes only. Robinson, Jim. "Boston's dedication bears fruit in community, citrus industry." The Orlando Sentinel, February 2, 1989. http://articles.orlandosentinel.com/1989-02-02/news/8902030156_1_oviedo-grove-boston. "World War II Rationing on the U.S. Homefront." Exhibits, America History http://www.ameshistory.org/exhibits/events/rationing.htm. 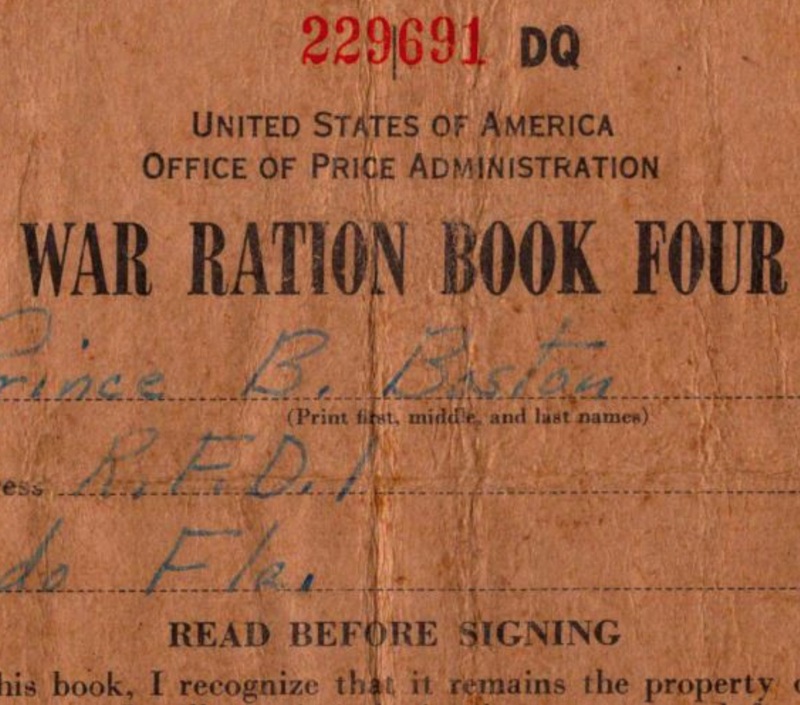 “War Ration Book Four: Prince Butler Boston.” RICHES of Central Florida accessed April 26, 2019, https://richesmi.cah.ucf.edu/omeka/items/show/5255.